Miso Robotics/YouTubeFlippy, a burger-flipping robot that just debuted at a CaliBurger location in Pasadena, California. CaliBurger, an international fast food chain, has debuted a burger-flipping robot named “Flippy” at a location in Pasadena, California. The robot can grill 150 burgers per hour. An increasing number of food retailers are exploring robotics as a way to increase productivity. The shift could be bad news for fast-food workers. At a fast-food restaurant in Pasadena, California, a worker named Flippy can grill 150 patties an hour. That’s much faster than the burger joint’s other employees, who unlike Flippy, require paychecks and benefits. That’s because Flippy is not an employee at all. It’s a burger-flipping robot developed by Miso Robotics. Featuring a six-axis robotic arm bolted to the kitchen floor, the machine works lunchtime shifts at CaliBurger’s Pasadena location, according to The Washington Post. 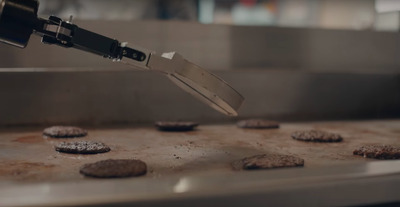 It receives orders through a digital ticketing system, and after a human worker places the burger patties on the grill, it monitors them throughout the cooking process and removes them when they’re done. To detect when an employee places raw meat on the grill, the bot uses thermal and regular vision as well as cameras. Though Flippy still requires a human worker to operate it, the technology could be a harbinger of things to come for the 3.8 million Americans who work in the fast-food industry. According to a 2017 report from Harvard University, as much as 40% of the US workforce could be replaced by technology by the early 2030s. In the past 30 years alone, approximately 80% of manufacturing job losses were due to technological displacement, and some experts say that the use of robotics will continue to spread to other industries, especially retail. David Zito, cofounder and CEO of Miso Robotics, is more optimistic. “Food is inherently social, so there will always be a place for people working in the restaurant industry – from creating the menu to interacting with customers to delivering food. This is why we developed Flippy. It will serve as an extra hand to assist kitchen staff, not replace them,” he told Business Insider. Zito adds that the startup’s intention behind creating Flippy is to help fast-food workers. A growing number of fast-food chains are looking to robotics to improve their productivity. The San Francisco-based vegetarian restaurant Eatsa, which specialises in quinoa bowls, automates the ordering and pick-up process. Launched in 2015, it has since expanded to New York and Washington, DC. Another Silicon Valley startup called Zume Pizza uses a robot to make its pies. Momentum Machines, which has secured over $US18 million in funding, plans to open a robot-powered burger restaurant in San Francisco. In 2012, Business Insider reported that the company believes that robots will replace some fast-food line cooks and custodial staff, but could also promote engineering and other tech jobs. KTLA reports that Flippy will start selling for $US60,000 to other fast-food companies in the next six months. Paying a minimum-wage worker sounds much cheaper, but the robot could lead to big efficiency gains over time.